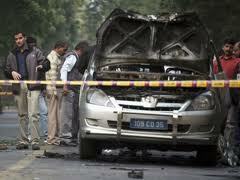 First, on Monday a magnetic explosive device was planted on the car carrying the wife of an Israeli diplomat in Delhi. She was injured and is still hospitalized in Dehli. Shortly afterward, there was an attempt injure a local Embassy employee on his way to work in Tsibili, Georgia. So far neither attacker has been apprehended but the Iranians are implicated. On Tuesday, Iran prepared but failed in an attempt to attack Israelis in Bangkok. Israeli security, represented by Defense Minister Barak said that Israel had been on the alert for such attacks and would retaliate. But why did the Iranians carry out these relatively ineffective attacks and why now? Why did they not trouble themselves to hide their culpability? Were the attacks a warning? DM Barak said more attempts are expected. Did the Iranians feel they had to respond after the US President’s highly public statement denying US involvement in the assassinations of the Iranian scientists and naming Israel as responsible? In addition, Obama has recently made sure to tell the Iranians publicly that Israel was stubbornly refusing his advice and would carry out a springtime attack on Iran. Why? Was he inciting? warning? punishing Israel for not buckling under to his demands? Or were the attacks meant to give Israel no choice but to open a conflict with Iran through Hezbollah, Iran’s proxy? It’s been obvious for some time that an Israeli-Hezbollah conflict would take international pressure off Syria’s President Assad. Israel has been watching and has responded to Hezbollah’s war preparations across the northern border in South Lebanon. Israel has been intensively improving the density of land mines along the borders, anticipating a potential civilian rush such as Assad set up not so long ago. Russia has been supplying weapons, equipment and backing which should keep the US out of actively intervening. Russia and the US both have carriers stationed and ready in the Mediterranean. While it’s unlikely that the US would take an active role in the war, the Russians would be likely to do so if they decide it’s in their interest. Meanwhile, facing possible protests in Tehran during an election, Iran has cut off internet service, including email and social networks and has tightened security in Tehran. Assad is on full attack on Homs and other Syrian cities. Iran, Russian and China are giving him backing. And the Arab League can’t decide what to do about Syria . They can’t depend on the West which is effectively neutralized, so it’s Assad’s revolution to lose. Saudi has decided to send in the Iraqi-Al Qaeda cells to help the resistance in Syria. Turkey is presenting unrealistic plans that Obama, locked in the current situation with Pakistan and Afghanistan, cannot possible approve, so Turkey is also sidelined. It should be clear from the above partial overview, that there are far too many potential answers to crucial questions, each carrying its own threat to ignite a major war in the immediate future. It appears that this is exactly the goal of some of the players. Iran doesn’t want the war on its soil. If Iran then ignites a war localized on Israeli and Lebanese territory, the Iranian home front and more importantly his nuclear installations will be protected, buying more time to prepare the missiles. Others such as Hamas, the Muslim Brotherhood and Al Qaeda would be only too happy to help broaden the conflagration. Iran for now is keeping western attention on the Gulf shipping lanes, carrying out military exercise after exercise, making wild threats and agitating at every opportunity. The Iranian leaders are smart enough to know that Obama really can’t afford to start a new war in an election year. It behooves us all to pay attention not only to the details, but to the underlying motives if we want to be prepared for what the next day might bring.